Rocky Ros Muc, a film supported by the Irish Language Broadcast Fund, is set to open in QFT, Belfast and The Eye, Galway on Friday 24th November. Directed and produced by Belfast based production company Below the Radar, it is a gritty film about Galway man Sean Mannion, a world-class boxer who left the Irish-speaking village of Ros Muc in Galway, for Boston, in the 1970s. 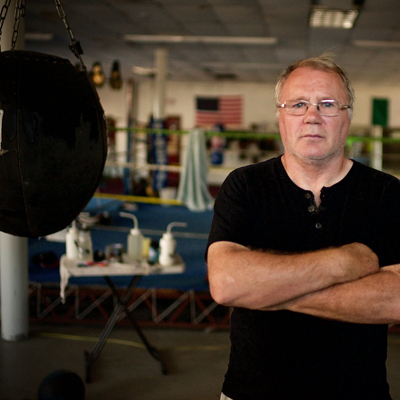 Rocky Ros Muc examines Mannion’s fighting spirit inside the ring as a professional boxer, and his life outside the ring where his sparring partners and friends at the time were at the heart of Whitey Bulger’s notorious Winter Hill gang and the South Boston criminal underworld. The film premiered in Boston in March and at the prestigious Galway Film Fleadh in July. It has already been released in cinemas in New York, LA and Boston. Director, Michael Fanning said: “We are really excited that finally, after several months on the film festival circuit, Irish audiences will be able to go and see Rocky Ros Muc in the cinema. Special Irish language screenings of the film are also happening in QFT Belfast on Sunday 26th November at 6.10pm and in The Eye Galway on Tuesday 28th November at 7.15pm (this screening will be followed by an Irish language Q&A). Rocky Ros Muc has also been submitted for consideration in the 2018 Academy Awards, a first for an Irish language feature documentary. The film was funded by TG4, Broadcasting Authority of Ireland, the Irish Film Board, Northern Ireland Screen’s Irish Language Broadcast Fund and MG Alba. Tá Rocky Ros Muc, scannán a mhaoinigh an Ciste Craoltóireachta Gaeilge le taispeáint sa QFT, Béal Feirste agus The Eye, Gaillimh ar an Aoine 24 Samhain. Ba é Below The Radar, comhlacht léiriúcháin as Béal Feirste a stiúir agus a léirigh an scannán. Is scannán é a dhéanann cur síos ar shaol an Ghaillmhigh, Seán Ó Mainnín, dornálaí den chéad scoth a d’fhág Gaeltacht Ros Muc sna 70í chun aghaidh a thabhairt ar Bhostún. Scrúdaíonn Rocky Ros Muc miotal an Mhainnínigh sa chró dornálaíochta mar aon leis an saol a bhí aige lasmuigh de – mar a raibh a chéilí speárála agus a chairde i gcroílár dhrong mhíchlúiteach Whitey Bulger agus iad sáite i ndomhan na coiriúlachta i mBostún Thiar. Is i mBostún i mí Mhárta a bhí an chéad taibhiú ag an scannán agus taispéanadh ag Fleadh Scannán na Gaillimhe i mí Iúil é chomh maith. Taispeánadh cheana féin é i bpictiúrlanna i Nua-Eabhrac, LA agus Bostún. Arsa Michael Fanning, Stiúrthóir an scannáin, “Chaith an scannán traidhfil de mhíonna ag na féilte scannáin ach tá an-áthas orainn anois go mbeidh deis ag muintir na hÉireann Rocky Ros Muc a fheiceáil sna pictiúrlanna. Beidh taispeántais speisialta den scannán i nGaeilge sa QFT i mBéal Feirste ar an Domhnach 26 Samhain ag 6.10pm agus in The Eye i nGaillimh ar an Mháirt 28 Samhain ag 7.15pm (beidh Q&A i ndiaidh an taispeántais seo). Tá Rocky Ros Muc san iomaíocht fosta do na Academy Awards 2018, an chéad chlár faisnéise Gaeilge ar fhad scannáin a bhí riamh san iomaíocht do na Oscars. Fuair an scannán maoiniú ó TG4, Údarás Craolacháin na hÉireann, Bord Scannán na hÉireann, Ciste Craoltóireachta Gaeilge Scáileán Thuaisceart Éireann agus MG Alba.